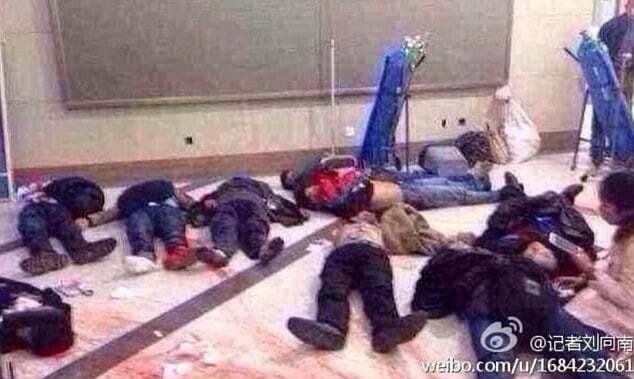 (NSFW) Why did Chinese knife gang murder 28, injure 113? Home Scandal and Gossip (NSFW) Why did Chinese knife gang murder 28, injure 113? 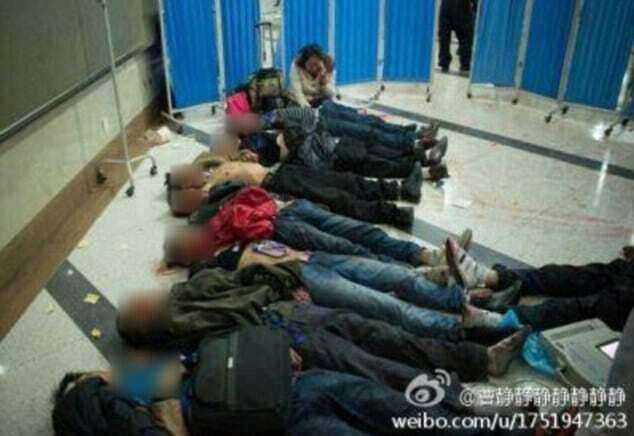 Why and how did one gang wreak havoc at one Chinese railway station? Authorities in China are trying to understand why and how a gang of knife wielding bandits came to kill at least 28 and injure 113 people at Kunming Railway station in Yunnan province. Update: Police shot dead four of the attackers – putting the overall death toll at 33, with 29 civilians dead and 143 injured. Two of the assailants were women, including one of those killed and the one detained. State broadcaster CCTV said two of the assailants were women, including one of those killed and the one detained. Since the attack, the web has been flooded with distressing images of strewn bodies, pools of blood and abandoned luggage scattered across the terminal floor. Many images since posted social media site Weibo have since been reportedly deleted by some netizens who claim that is what the terrorists would have hoped for. The government have also been assertive about deleting images. Police would shoot dead five of the unidentified attackers and are now seeking up five other fugitives believed to be involved. At present, authorities have contained several suspects. The attack is said to be described one of the deadliest in recent Chinese history. 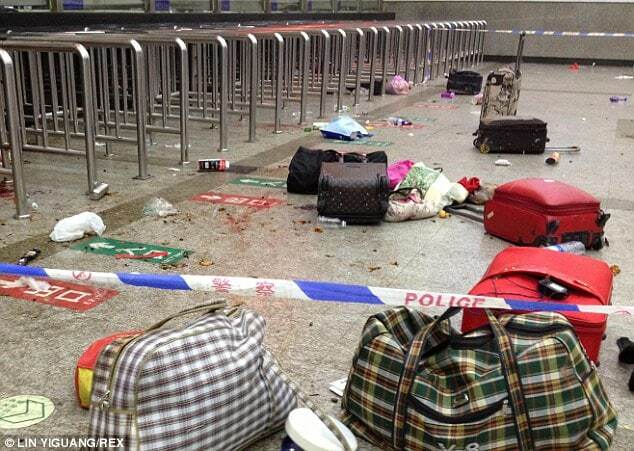 To date local press tells that the identities of the attackers have not been identified and that Kunming city police did not have immediate information to release. Resident Yang Haifei told Xinhua he was buying a ticket in the station when he saw a group of people rush into the station, many of them dressed in black, and start attacking people. At the time of the attack, witnesses told that the gang were wearing uniforms when they stormed the railway station, whilst gunshots were heard after police responded. 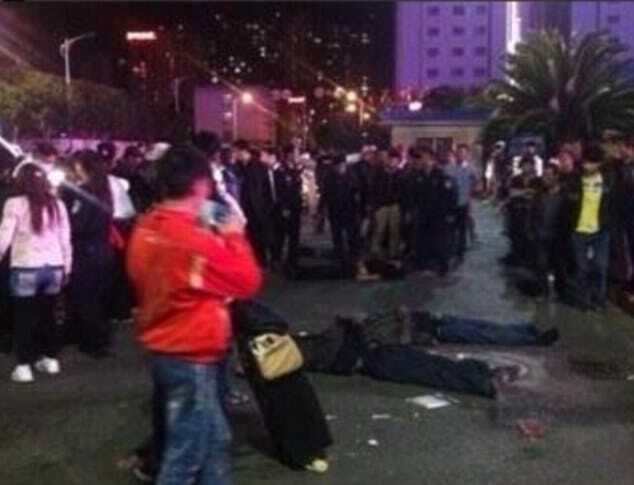 Yunnan province where the attack happened has an approximate population of 6 million. Kunming the city in which the attack occurred is about 1,300 miles southwest of Beijing, and is described as a bustling university town and major commercial hub on trade routes linking southern China to neighboring Vietnam. Kunming Railway station, where the attack happened is one of the largest in south west China and opened in 1958, with up to 75,000 passengers a day passing through it. What is being asked is why the gang targeted the train station in so far that there was a confluence of high traffic individuals gathering at the outlet and would presumably make easier for a high velocity attack. Nevertheless why the attackers struck or whether they were a member of a dissident group has not immediately been known or understood. Yet one theory making the rounds is the fact that China has seen a number of mass stabbings and other attacks carried out by people bearing grudges against society in the past. In June last year at least 27 people were killed after gangs armed with knives attacked a police station and a local government building in a remote region of western China. 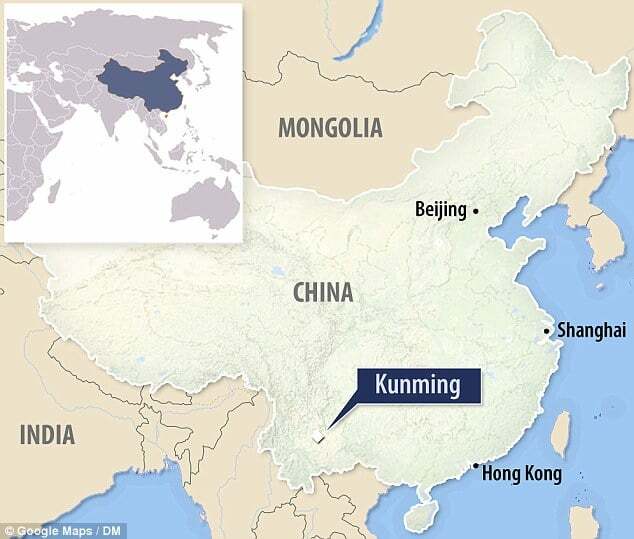 Mobs in the Xinjiang region, home to a large Muslim Uighur minority, were said to have set upon buildings in the township of Lukqun at around 6am, stabbing people and setting fire to police cars. The attack comes at a particularly sensitive time as China gears up for the annual meeting of parliament, which opens in Beijing on Wednesday and is normally accompanied by a tightening of security across the country. China has blamed similar incidents on Islamist extremists operating in the restive far western region of Xinjiang, though such attacks have generally been limited to Xinjiang itself. 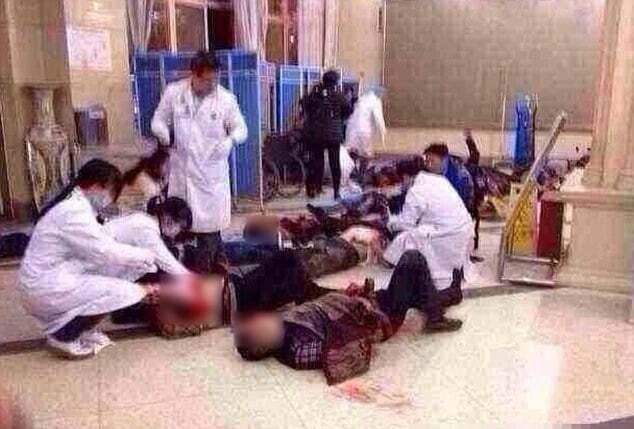 Reacting to the murders, Hu Xijin, the editor of government run newspaper, the Global Times said it was important not to allow a ‘vacuum’ in which groups could be unfairly blamed for the train station attack. ‘If it was Xinjiang separatists, it needs to be announced promptly, as hearsay should not be allowed to fill the vacuum,’ he wrote. President Xi Jinping has urged the law enforcement to investigate and solve the case and punish the terrorists in accordance with the law. It is not a gang, it is a terrorist attack! The captured attacker was wearing a T-shirt with a Jihad slogan, and witnesses had reported escaping attackers wearing similar T-shirts. There are about 20 of them attacking ticket queues in the station hall and passerbys in the block, announcing a general atmosphere of terror, which is very scary so very effective as a terror tactic. Why did people ran instead of fight these terrorists? By running you could trip and be chopping blocks. If you fight, you have a chance against only 10 attackers. Didn’t people learned to fight back after the 911 place terror attack in the New York City? Kunming has a population of over 46 million. This article cites 6 million. Chinese don’t even need to use gun, they all know how to use knifes, and martial art weapons. Muslims/Islams are nothing but troublemakers. They are full of hatred, kill anyone and for no reasons.